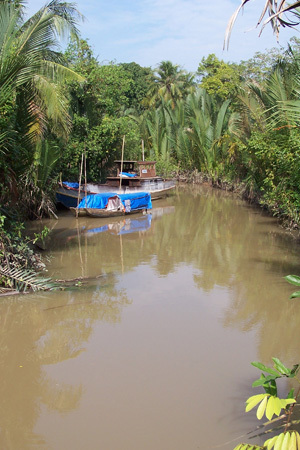 This is a chronicle of our 5 day bicycle journey through the Mekong Delta of South Vietnam. 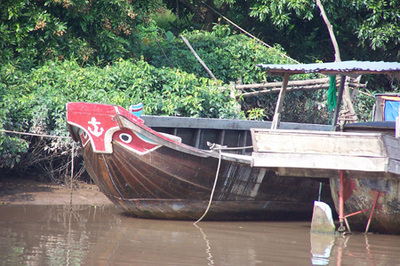 We used a company named “Tulip Tours”, however their Vietnam portion is being renamed as “Delta Discovery”. We highly recommend this company and tour. They provide the directions, bikes (panniers, tools), odometer, emergency phone contacts and hotel reservations - then you are on your own to make your own adventures. We have spent the previous 4 days in Hanoi. On the way to the Hanoi airport we see the only motorbike “accident” as a couple of kids drive full tilt over a speed bump and the bike slides over. They are up and back on the bike in an instant, rubbing the road rash on their hands. We leave Hanoi (or try to leave Hanoi) as the flight is delayed for 4 hours. The plane is delayed due to “mechanical” – no noun at the end of the sentence. They serve an “airline lunch” to the waiting customers and we walk, hang out, read and the time passes. The representative from Tulip Tours meets us right on time at our hotel and we get our first glimpse of the bikes, route and details. Anticipation, mixed with a bit of anxiousness about what to expect. There is a driver and guide who drive us about an hour outside of HCMC. We pack our stuff into the panniers, (there is ample space) buy some water, set the odometer and are pointed in the correct starting direction. Off we go! 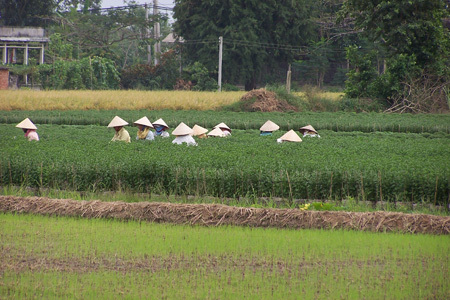 We pass beautiful green rice fields with tiled homes in hues of lavender, blue, orange and many colors. The women really do wear the pointed straw hats – everywhere in the fields and along the roads. 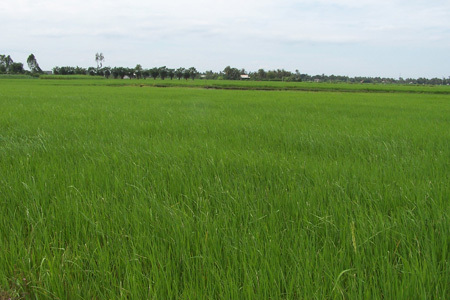 The blue of the sky and the green of the fields, the openness of the road and being on a bike – it’s great! This is a narrow, paved road with minimal traffic – bikes, motorbikes and the occasional car. We are routed along different roads and pathways as we make our way through the morning. Literally 100’s of students on bikes are on the road – we can’t quite figure out the schedule – why are there so many in the middle of the morning? Later we find out that there are 2 schedules and the “shift change” occurs at 11:00. All the students are in uniform – white shirts with red tie and blue pants for some of the younger children while some of the older girls where a beautiful white patterned tunic over black or white pants. They look so graceful, holding the front of the tunic in one hand on the handlebars, sitting up so straight while pedaling down the path. We stop by a “restaurant” at the side of the road before crossing our first of many ferries. With no language translator we somehow manage to indicate that we want something to eat. (Later we buy a small dictionary to help with this!) They serve us some soup (clear with green veggies and pieces of squid or octopus) – actually not bad, rice and some small ribs (pig we hope and not dog!) It fills the hunger holes and we’re off again. The “ferry” is a small, old (everything is old and falling apart) and cost 6 cents (1000 dong). We cross a small arm of the river. 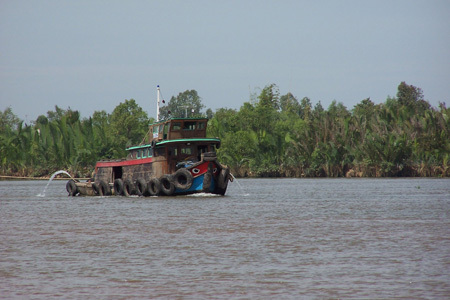 As we continue on our journey we find that the Mekong is a huge river with 1000’s of small arms throughout the delta that we are continuously crossing on either bridges or ferries. More sheltered pathways, coconut palms and banana palms. Then the directions say “rough road” – yikes, it’s accurate. Bounce, swerve, rocky, - it’s the worst road of the whole trip. (Maybe better to get it over with the first day.) Finally we’re off this road and into the town of My Tho – our first overnight. The bikes have been great – comfortable, sturdy, lots of room in the panniers. 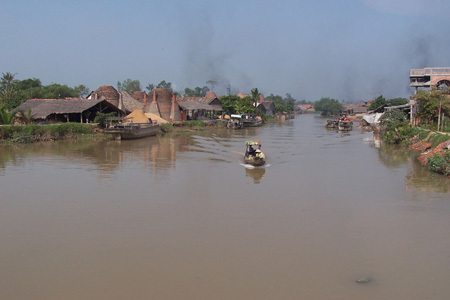 The hotel is alongside the Mekong and our room looks out over the river. Our bikes are parked in the hotel lobby along with a few motorbikes. Nice room, quiet, good view. It’s great to get the road dirt and sunscreen washed off. We eat at the restaurant alongside the river – great Szechwan Tofu and we’re really getting to like the Vietnamese Tiger beer after a hot day in the sun. Breakfast at the restaurant is what we’re finding to be a standard – Chinese noodles or tea, jam and bread. The French bread must be a hangover from the many years of French influence. There are no eggs (bird flu??). OK we’re ready for the next day of the adventure. EVERYONE says “hello” and we answer back. A few will yell “What is your name?” but most settle for just hello. We must yell “hello” a couple of hundred times each day. 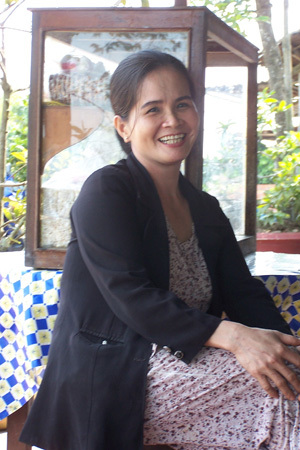 But it’s fun – every hello we get is accompanied by a wide smile and if from the children usually a lot of giggles. We are out of the ordinary here – the foreigners, one with blond hair and one with a beard (not seen in this culture) and long hair. So, we get lots of stares but all good natured and the people are very friendly. We travel down some wonderful pathways. 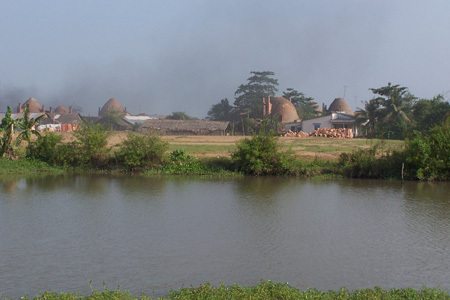 We are now away from the “upscale” housing and back with the river crowd –simple wooden shacks and houses. The pathways twist and turn always near some small branch of the river. Sometimes the pathways are paved, sometimes dirt, always very narrow and very beautiful. We stop for a pineapple (custom cut) in a “café” by the side of the road. We use the term café loosely as one from the west would never put this term next the place we stopped. There are hundreds of small places with a few wares in the front (chewing gum seems popular, fruit, veggies and a few packaged items, sometimes soda pop). This one lured us in with the pineapples in front. The man there is very interested in the odometer on the bike and in the route we are taking – again no English but we make some type of communication. We continue on – biking and stopping now and again for pictures or food. We’re getting into the rhythm and relaxing. We stop for some fruit topped with shaved ice (the man took part of a big block of ice and put it through a manual grinder) into which was poured some kind of red syrup and condensed milk along with peanuts Later we stop again to buy some small oranges and yams. School shift and/or lunch hour seems to be around 11:00 and here in the middle of what looks like nowhere are many school children on break. Some are eating, but some are playing video games – such a remarkable contrast – old computers in a run-down open faced wooden structure! 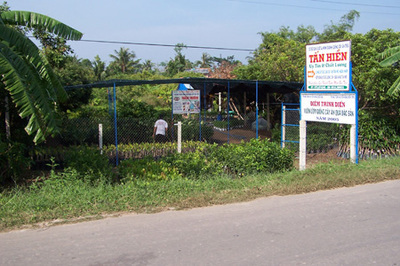 Others are playing billiards (we see many billiard tables along our route – either used by children or men). We figure the women are all busy taking care of children and cooking while the men play billiards! But life here is much more relaxed for all – we see so many people just sitting and talking, sharing a cold drink, relaxing in a hammock – so different from our western, goal oriented, driven society. The next part of our travels takes us past miles and miles of plant nurseries. We wonder where these plants will be shipped – all over Asia? The world? We take a picture thinking of Darice in the plant industry back on Long Island. Tonight is our homestay. 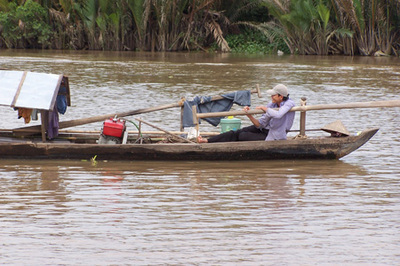 We follow the directions and come to a home alongside another branch of the Mekong near the town of Vien Long. We are greeted by an older man who asks if we speak French – we pull some long forgotten words out of our past and are able to communicate roughly with our host. Billy’s pretty good with the language. Along our trip we find that many of the older people speak French, the next generation speaks Russian (previously taught in schools) and the current generation speaks English (now replacing Russian in the schools.) This older man’s daughter speaks English and greets us and shows us around the home. The home is a large house with an assortment of many topiary trees in huge pots in the front yard, a hanging orchid garden in the back, multiple outdoor kitchens, simple furnishings, 3 large ramadas and four toilet/shower stalls. 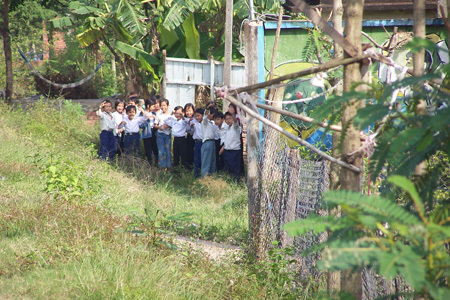 Adjoining the house is a large orchard of lychee trees (a local fruit). In the dining room is a huge table topped with glass with about 200 business cards under the glass – from visitors all around the world. There is another room with pictures of the older man’s parents who started the first part of this house and who are worshipped every night with a lighting of incense. On the anniversary of each of their deaths the entire family (many members) gathers to remember them and to celebrate – that’s what the many ramadas and cooking facilities are for. The daughter shows us bullet holes in the ceiling of the home from 1962 during what this country calls the “American” war. Her father was neutral during the war and because this was a large home, the South Vietnamese air force thought that they may be hiding enemy soldiers there – hence the bullet holes. We discuss the wonderful fact that the war is behind both of our countries and we are now able to visit in peace, to meet people and be invited into their homes. The showers are cool water, but who needs hot water in this hot climate? 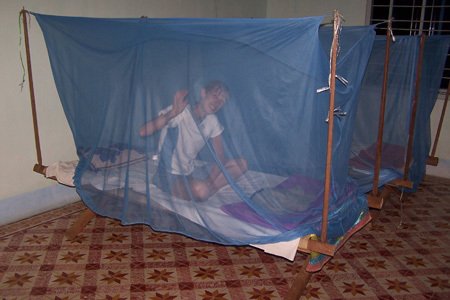 We check out our quarters for the night – simple cots with mosquito netting – adequate and comfortable. We clean up and wash out clothing for the next day, then sit and enjoy the quiet peace of the surroundings. Oh yeah, I forgot to mention the 12 foot python pet snake in a cage in the back yard – apparently he likes to be taken out and petted. 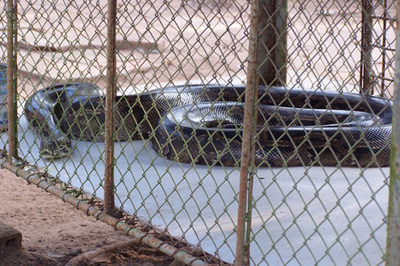 There is a brother with a young child who lives here and the snake and the child are about the same age (5 years old). Dinner – this one ranks up their with the best of any we’ve experienced. The older mother is a great cook – such a small, graceful, beautifully featured woman. A red tablecloth adorns an outdoor table and we are served dinner. We expected that we would get to eat with the rest of the family, but they had eaten earlier and this is the way that they treat the visiting guests. So we are served at our table a delicious dinner of “elephant ear fish” – deep fried whole fish, chunks of which you put in rice paper with lettuce, mint, cucumber and dip in a light sauce – exquisite! Along with this are homemade spring rolls, 2 large shrimp, beef cooked in coconut milk, so tender it melts in your mouth, vegetable soup, rice and pineapple for dessert. Wow! All from an outdoor kitchen. It’s early to bed, listening to the small boats along the river. Breakfast at 6:30 is again French bread, tea, and jam – just perfect after last nights large dinner. We’re off on another adventure. We leave early as the last ferry to get to our evening destination leaves at 4:00 and we don’t want to miss it! We pedal through villages, pathways, roads. Around 10:30 we are pedaling along a larger road (big enough for cars as well as motorbikes and pedal bikes) and are getting hungry and in need of a cool drink (it’s hot outside with lots of sun today.) We pass a couple of cafes (remember everything is outside) and at one, some people motion us to come in, so we ride back and find 5 men sitting eating and drinking what looks like hot tea – they offer some to Billy and it’s immediately apparent that it’s not tea – homemade rice alcohol and it’s also apparent that they have been drinking a bit before we arrived! Good natured men, but with no common language we communicate with gestures and smiles. They want Billy to drink a shot with each one of them, but he gestures to make them understand that he can’t drink and then ride a bicycle! They are eating some kind of mixture of meat, peanuts and who knows what along with French bread and watermelon. 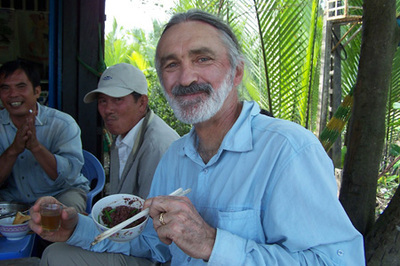 We join them sharing their food, talk, laugh and they continue to drink – Billy gets by with just sipping a small glass of alcohol as they continue to do shots. He has to take a sip as each one drinks a shot. Ann, as a woman, gets excused from participating in the drinking part! She has a Pepsi! Next, with much fanfare, out comes a special can of something that they are eager to share with us. From all the excitement it seems to be a delicacy of Vietnam (or maybe it just goes well with rice alcohol!) It turns out to be some sort of fish (like sardines) in tomato sauce – we put it inside the French bread and dip it in soy sauce all the time smiling and acting like it’s really tasty (NOT – but Billy really thought it was good but I’m not sure about his judgment at this point). After we have eaten some, we make the “It’s really good, but I’m much too full to eat any more” gesture and also do the “We really must be going” gesture. We take digital pictures and they love to see them – we wish we had a way to send them a print. As we get ready to leave, they will take money only for the Pepsis and we feel the mutual enjoyment of being in each other’s company. What fun! Billy does not seem worse for the experience and we continue on our journey. It’s interesting how the word “café” has survived and become part of the language here. Today takes us past many, many brick kilns – we see the whole process – the clay, rice husks for mixing into the bricks, the unfired bricks, the kilns, the finished bricks, all alongside the river for transportation. There are fewer small paths today and more real roads. 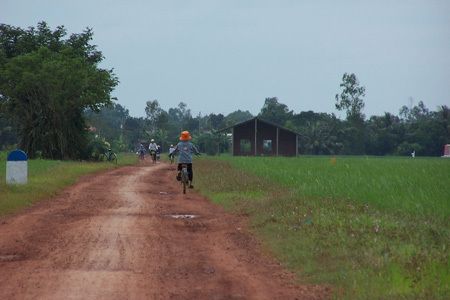 We bike a 25 km along a long road until we reach a town. 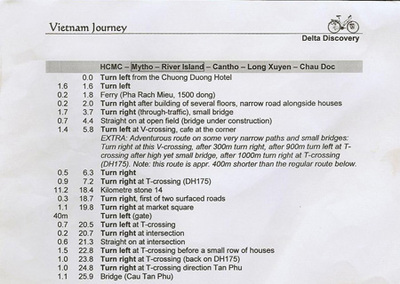 Our directions tell us that from here we will take a 90 minute ferry to the city of Can Tho. Well, I have to laugh – my unconscious expectation of what the ferry would be was immediately shattered when we found the pier. This ‘ferry’ is an old, old boat with wooden benches inside the engine compartment and room for cargo on the roof. We manage to find the right ferry and the driver helps us lay our bikes on the roof. Luckily we can ride on the roof along with the bikes – much more pleasant than riding down below. In this country, if you ride along on the roof and you fall off, it’s your own fault! We cruise down the Mekong river – watching the boat traffic and the homes along the river – what a beautiful ride. 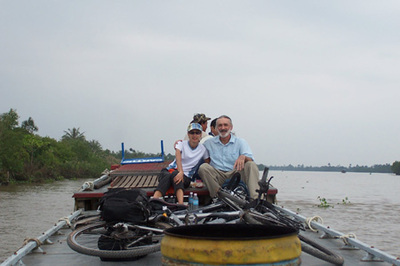 We approach Can Tho and can see that this is a large city. 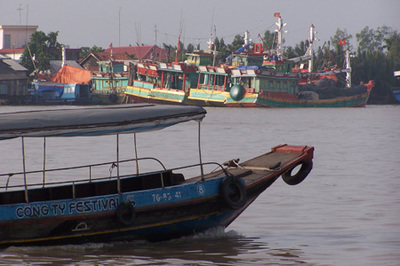 The peace of our journey is shattered on arriving at Can Tho – the pier is a zoo of activity with noise and bustle everywhere. A VERY persistent woman keeps telling us that she has a place where we can stay, a worker on the pier yells at the woman and motions for Billy to watch his wallet. We try to tell her that we already have a place to stay and try to get away from her. As we bike down the street trying to follow the directions to our hotel, she follows us on the back of a motorcycle! Finally we find our way through the city traffic and I guess she gives up and leaves us. We check into our hotel and find ourselves in the middle of a large Vietnamese city – our room faces the street and we get the full impact of the hustle and bustle there. Such a shock after our 3 days of idyllic country wanderings. It’s Christmas Eve and there are many young children dressed in red Santa suits riding with their parents on their motorbikes. We ask about Christmas celebrations. While there are some Christians here, most people just celebrate because they like the holiday. There is a streetside bakery that is amazing in its busyness – there are at least 8 girls in front taking orders and 3 people behind taking and changing money – the motorbikes just drive up for curb-side service. The amount of French bread and rolls that are going out by the minute is astounding – as well as other baked goods and boy does everything smell good! We’re too tired for much exploring so we have dinner at the hotel. We ride out through the city traffic, but it is much more negotiable than Hanoi and actually quite fun to be part of the morning commute. It’s busy riding for the first part of the day until we finally settle into some small paths and quiet riding. We stop for an orange drink at a small café – also looking for a toilet. Our dictionary comes in handy and we are able to make our needs known. Now, how to use this facility is another question. There is a small room back by the river – no toilet or bowl or indication of how one is to do their business. In the room is a small washing bowl, some laundry that is hanging, a couple of buckets and a very large bucket filled with water with a scoop. Hmmmm… where to go? On the floor? In a bucket? I decide on the bucket, then scoop water into it and toss it in the river… After I do this, a lady shows me how to take a scoop out of the bucket and toss it over the floor of the room (which drains down to the river). So, anyway the bladder got emptied and felt much better! After all this dilemma, Billy chooses to use the side of the road. We buy a couple of oranges and sit by the river for a rest. Later we buy a grilled rice covered banana and some fried thing which tastes like some sort of fruit inside the fried covering. We were getting pretty good at buying ‘street’ food. As we sit by the river, an old lady and young child come over and again, although we have no common language, we smile and gesture. A few more kids gather around us as we are always a source of curiosity. 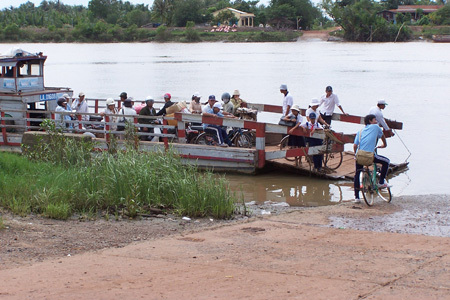 Later in the day, we are pedaling next to another of the branches of the river and along some simple homes and see some pineapples for sale. We stop and are immediately the center of attention of about a dozen children and about as many adults. They gather around us, and have lots to say to each other – one little boy has a “Spiderman” shirt on and giggles as we gesture and demonstrate what a spider does. It’s really fun and they enjoy our visit as much as we do. We travel some rough paths and millions of ‘bridges’ in every state of disrepair. All too soon we are back to the city and the hotel. We make some Christmas phone calls to family – still amazes me to be able to be in touch with people from anywhere in the world. We find a quieter section of the city down by the river and have an early dinner at a restaurant along the river – great food and excellent spring rolls. We walk along the river and just sit and people-watch. We take a short ride early in the morning out to the ‘floating market’ but it’s not as interesting as we thought or maybe we just weren’t in the right place for the full impact. 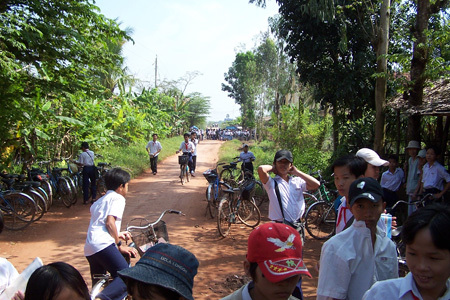 It’s fun to be part of the early morning commuters – lots of schools kids on bikes, locals on motorbikes. But we’re back in time for breakfast and get ready for our pickup and return to HCMC. We are so disappointed that we won’t be riding more today – next time we would definitely choose the 7 day option instead of the 5 day trip! Our pick-up arrives right on time and we have a 4 hour ride back to HCMC. The ride back is fine and interesting to watch the countryside, towns, people – but boy can you see and feel so much more on a bicycle than in a car!! 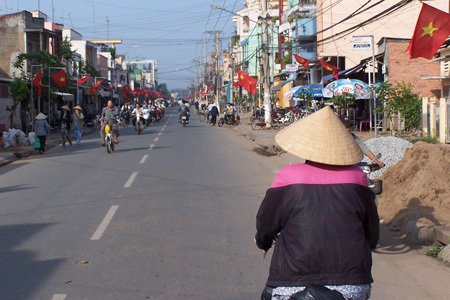 The driving here is not anything like the drive we took south of Hanoi – the highways are ample for the traffic and everyone seems to stay on the correct side of the road and follow the rules. 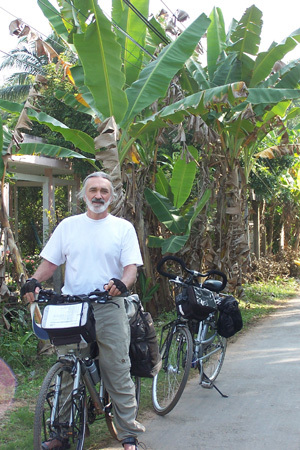 The bikes have been excellent – Ann had a Batavus, Sicorro model while Billy used a Trek X500 Navigator. They were in top condition and very comfortable for riding. The panniers were very spacious and the Xiron computer/odometer worked well. We did a good job with packing the right kind of clothing and accessories – if we went again we would bring a Vietnamese phrase book. We have 2 days in HCMC before our flight to Malaysia. There are numerous warnings about pickpockets and there are policemen on every corner in the tourist section. One writing tells you to “guard your bag like a toddler at a fun fair”! We walk the streets, use the health club, swimming pool, do a bit of shopping, get a foot massage and generally get reacquainted with city life. We leave HCMC at 4:30 in the morning (the hotel made us a box breakfast to take along) and our taxi flies through the early morning empty streets disregarding any and all traffic lights. We see one man actually sleeping on his parked motorbike while others are sleeping in their pedicabs. It’s on to Malaysia. Directions for the day - without the odometer we would be very lost! First of many ferry crossings - drive on and pay your 6 cents. All the boats have eyes. How can this boat stay afloat? Stop for a map check along the route. 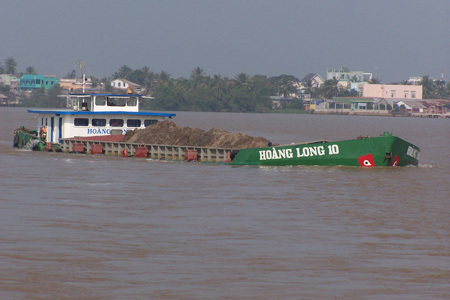 One of thousands of arms of the Mekong. 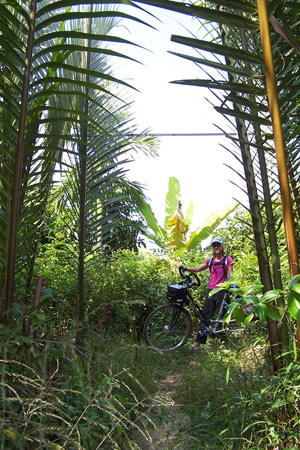 Biker spotted among the banana palms. 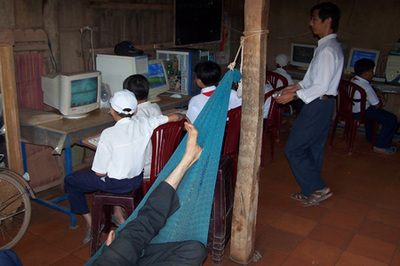 Lunch and computer games for kids - I guess they're a hit all over the world. Lunch break for a local school along our route. 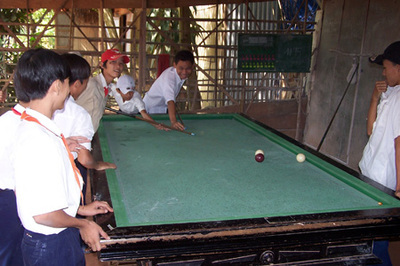 Billard table near local school - kids sharpen their skills at lunch time. Girls in beautiful uniforms - we saw hundreds. Younger children have simpler uniforms. Group of children in front of local school all wave and yell "hello." We passed miles of nursery on one section of journey - where will they end up - all over Asia, the world? Grab a banana for the ride ahead! 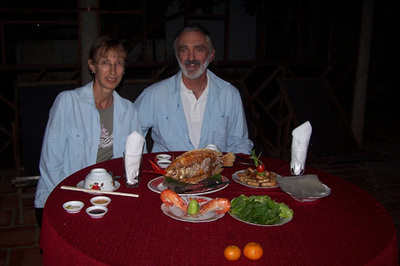 Superb dinner at our homestay - elephant ear fish, homemade spring rolls, shrimp - later came the rice, soup and pineapple - YUM! Sleeping under mosquito netting during the homestay part of our journey. 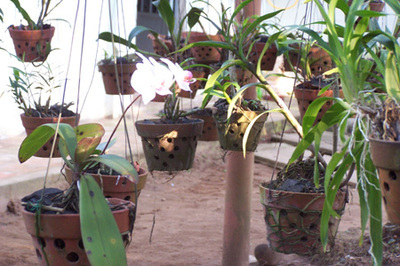 Hanging orchid garden at our 'homestay' on the bicycle tour. Huge 5 year old pet python - been in the family since it was small - they say he likes to be held and stroked! More brick kilns along the river. 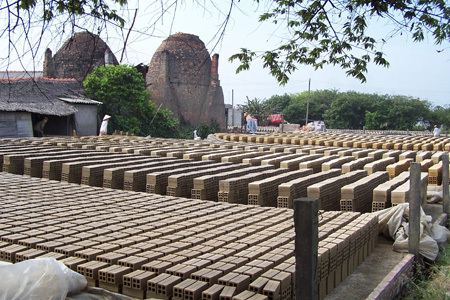 Bricks in all stages - wet clay to finished product. 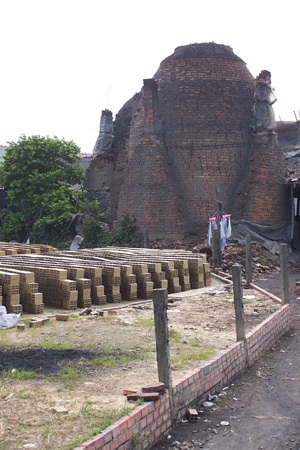 One of the many brick kilns we passed on the third day of our bicycle tour. 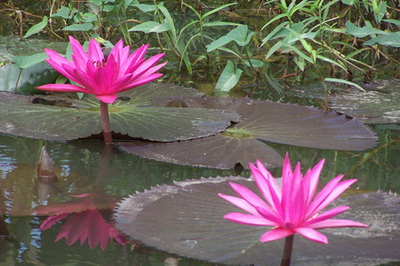 Who can resist a shot of such a beautiful flower? The river is a main source for transportation of goods. They all want Billy to drink shots with them, but he is able to escape with taking a small sip for every shot they take. Ann is excused - she gets a Pepsi. Sharing food and rice wine at 10:30 am. 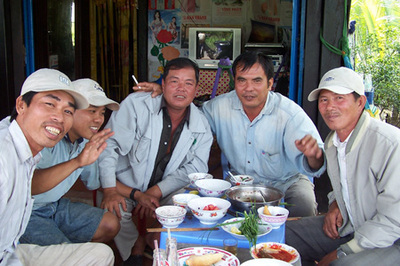 The 5 gentleman anxious to visit and share their food and rice alcohol with us - they liked getting their picture taken. Someone has to run the store while the men eat and drink. This was the wife of one of the men who were so happy eating and drinking in the morning. 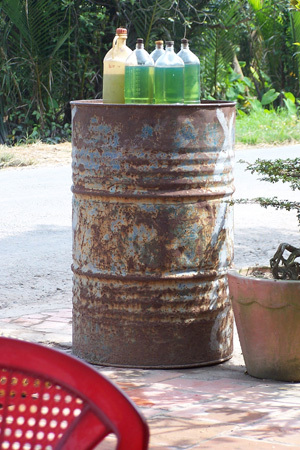 Any container will do for selling gasoline. Bikes were laid on the top of the ferry roof - we chose to ride the roof instead of down below where it was crowded and less fresh air. 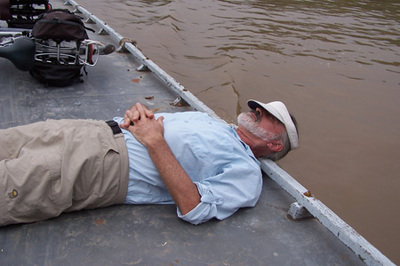 A snooze on the one and a half hour ferry ride upriver. Billy is on the top of the ferry along with the bikes. 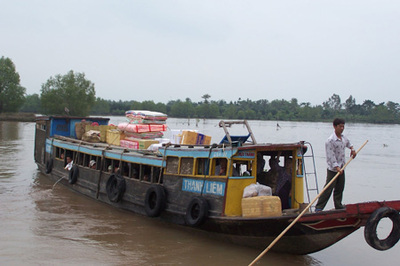 This is what the ferry we were riding on looked like - people on the bottom and goods on the top. 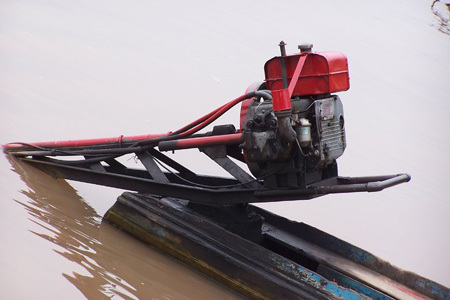 Outboard motor for SE Asia - Thailand, Vietnam, etc. Maybe so the boat can see where it is going? ?